Miles is almost 3 months old (how did that happen?!!) so I thought now would be a good time to share what products we are loving and have found essential for these first few months. Obviously this will change as he gets older so I will do an update one or two more times this year to share new products we have discovered. 1. 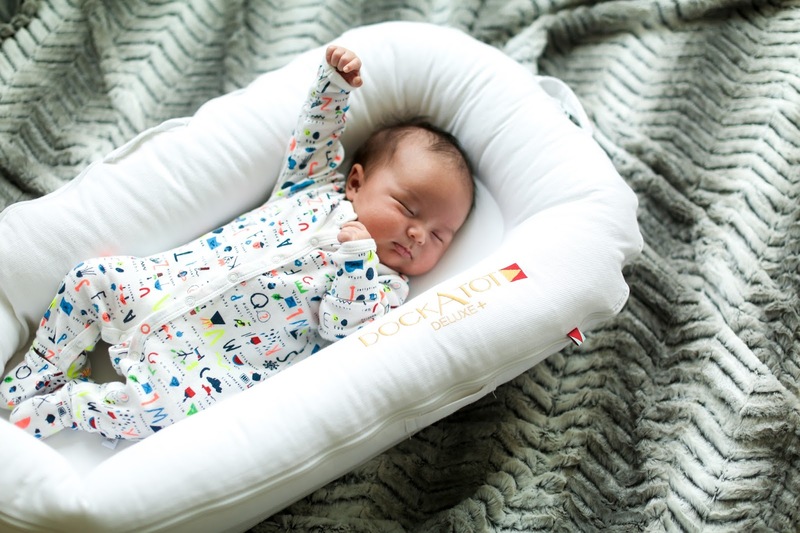 Dockatot (c/o) - The first thing my mom said after our first week home with Miles was "this is the best invention EVER!" We don't have him sleep in this for long periods of time or unattended, but this is absolutely perfect for keeping him in one place near you. I use this in the bathroom while I'm getting ready, on the floor next to me while watching TV, in my office when working - basically it allows me to comfortably keep him near me and know he is in a secure place. 2. Skiphop Activity Gym (c/o) - From as young as one month, we would lay him on here to give him stimulation since it has both lights and sound. As he has gotten older, we use this multiple times a day to give him "exercise" and keep him alert. We also use this for tummy time. 3. Fisher Price Kick and Play Piano Gym - I saw this on Instagram and instantly went online to search for it! He didn't start enjoying it until around 2 months when he began moving his legs more. Now, he taps away on the little keyboard and loves both the feeling and sounds that it makes. We use this every single day because it keeps him entertained and has helped him become more alert. And for the price, it is an absolute must have! I also just bought this Fisher Price seat which will be perfect for him now that he is slowly beginning to hold his head up. 4. Boppy Pillow - WE COULD NOT FUNCTION WITHOUT THIS! LOL He has been in the boppy since birth either for feeding, napping or keeping him awake next to me - basically he is in and out of this all day long. It helps keep him propped up and in one place when he is in the room with us. This is THE first product I plan to buy for all expectant moms moving forward - we love it! 5. Ollie World Swaddle (c/o) - I alternate between the Halo SleepSack and this. I love that this allows for the arms/hands to be in or out. Miles prefers his arms out so we just swaddle him in this before every nap or bedtime and he instantly begins to calm down. And now he associates it with going to sleep so I see him begin to get tired after it is put on him. 6. 4Moms MamaRoo 4 infant seat (c/o) - Miles has enjoyed this now that he is a bit older because he can focus on the mobile above him while being soothed by the different rocking motions it provides. He doesn't fall asleep in this, but it keeps him entertained while we are in the room. When Stan and I work out together at night, we put him next to us in this and he babbles to himself the entire time while staring at the mobile above him. He absolutely loves it! 7. Solly Baby Wrap - I was unsure whether this would really be worth it for me, but I now use it almost every single day. It's too cold now to use it outdoors since I would have to bundle him up and then stuff him into it, so for now I use this at home. I put him in it every night to keep him awake before his bedtime. We feed him at 3:30pm and then again at 6:30pm before he goes to bed, so I try to do what I can to keep him up so he is extra tired by the time bedtime rolls around. It takes some getting used to when it comes to wrapping it correctly and putting him in it, but now I have the hang of it and he instantly calms down as soon as he is in it. 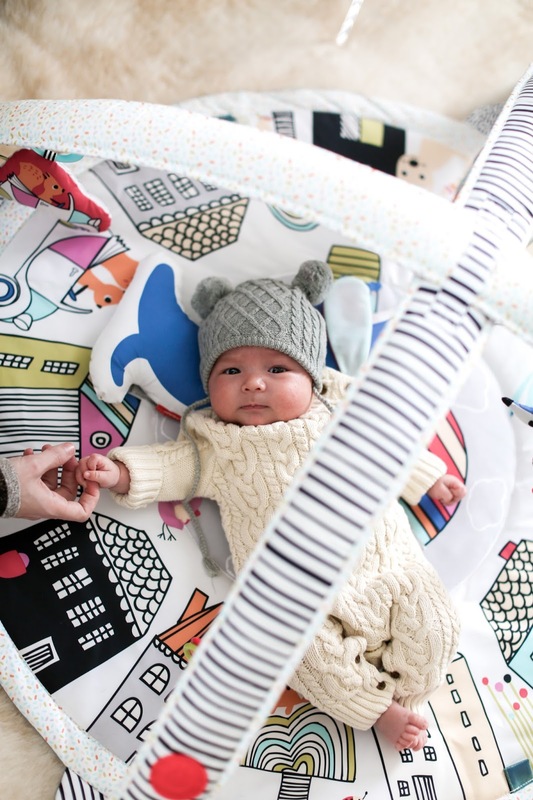 One tip: put it on in front of a mirror and put the baby in it in front of a mirror - it helps me put the straps in the right places and make sure he is completely secure. 8. Blooming Bath Lotus - This soft cushion is a lifesaver at bathtime because it fits in the sink or in the baby tub we purchased, but is soft enough for those first few months. The baby bathtub we bought appeared too hard to me (nervous mama) so this seemed like a better option and we use it every single night. 9. Wubbanub - As you can see from the above pics, he does love a pacifier. He doesn't use it all day or even need it all the time, but when we do this is the one he favors the most. And it is actually the same type of pacifier that they gave us in the hospital. The little stuffed animal helps it stay in place a bit better and not fall out all the time. 10. Uppababy Vista Stroller - Best stroller ever. We love this thing and find it ridiculously easy to assemble and disassemble. It has just enough storage and is incredibly easy to maneveur even over rocky or uneven terrain. 11. Nuna Pipa Car Seat - We went with this carseat because it is one of the lightest on the market. It is still quite heavy once he is in it, but compared to the other ones we tried it much lighter and easier on your arms. 12. Aden + Anais swaddle cloths (c/o) - Those cloths they give you at the hospital were nearly impossible for me to use and get a secure swaddle which was so frustrating. As soon as got home, I pulled out these Aden + Anais swaddle cloths and they made swaddling the easiest thing! The fabric and texture make them foolproof for creating the perfect swaddle. Since he is older we don't swaddle him anymore, but still use these for when he may be cold in the carseat, under him in the Boppy in case he has a bad diaper, wrapped around when we are rocking him to sleep - I always have one nearby and in the diaper bag. These along with the Boppy are my favorite gifts to give an expectant mom. 13. Tommee Tippee Bottle Warmer - Miles is now exclusively on formula and this bottle warmer is easy to use and has multiple settings to accommodate frozen, cold and room temperature as well as varying bottle ounces. We use this for every single feeding. 14. Ubbi Diaper Pail - This thing is so pricey but holy cow does it help mask the smell of diapers! And it is incredibly easy to use. I ended up buying a second cheaper diaper pail for downstairs because we didn't want to go upstairs every time to change him. Bad move. It doesn't mask the smell as well and you have to push down a little door to throw the diaper away. And when you are trying to throw it away quickly, that added step of pushing the top open is a nuisance. The Ubbi pail allows you to simply leave the top open to throw the diaper in and then close. 15. Dr. Brown's Bottles - I am including these because they are the bottles we use but to be honest, I don't really know if they are better than other ones. They seem to get the job done, he easily drinks from them and doesn't have a ton of gas. 16. 12 Hours of Sleep by 12 Weeks Old - This book has been the single most helpful thing I purchased. We began following it when Miles was 6 weeks old and he slept through the night very shortly after. Now he is sleeping 11-12 hours each night because of the routine and structure we set using the tips in this book. It may not be for everyone, but it has worked wonders for us. 17. Favorite clothing brands: I adore Huxbaby, GAP, Hanna Anderson, Kickee Pants, Nordstrom Baby and Carter's. Obviously I am always looking for new cute outfits, but those brands are ones that stick out to me as favorites right now. 18. Crane Humidifier - I was on the fence about whether I needed a humidifier but after Miles sounded congested a few weeks ago, we headed out to Target to pick up this one. I love the sleek design, the fact that it has different settings for how much mist it will emit and is very easy to clean. And Miles' congestion began to clear up only a few hours after having this in the house and has not been a problem since.